Goodrock Park. – Page 2 – it's not a farm … yet … but it is a work in Progress. Is it in Australia’s interests for small farms to be replaced by larger corporate entities? It is in Australia’s interests for small farms to be replaced by larger corporate producers. Australia cannot afford to protect family farms from the economic pressures of the global food market. Whilst understanding that newspapers rely on brevity, broad brush-strokes and shallow commentary, it is important to remember that brevity is actually the enemy of information and does absolutely nothing to build knowledge nor understanding. Can the world go Vegan? A studied viewpoint regarding Vegan vs Omnivorous Farming. Can we feasibly change our omnivorous farming practices? A studied viewpoint regarding Vegan vs Omnivorous Farming. For those who are making the trek out to our little slice of muddy heaven to assist with our planting day, I have put together a rough map to help guide your way. One of the many issues with rural properties is that grid-based services are often not available – or only available at an implementation cost that is excruciating to look at. For example, electricty connectivity could be between $7,000 to $24,000 depending on above or below ground cabling and the length of connection. That, by the way, is only up to the front gate – you still need to then run cables across your property – and all of it must meet public roadway standards … so suffice to say, it can be an attrociously expensive exercise. I have been running a number of simulations for solar and wind power systems, and decided that there were definite advantages to remaining off-grid. 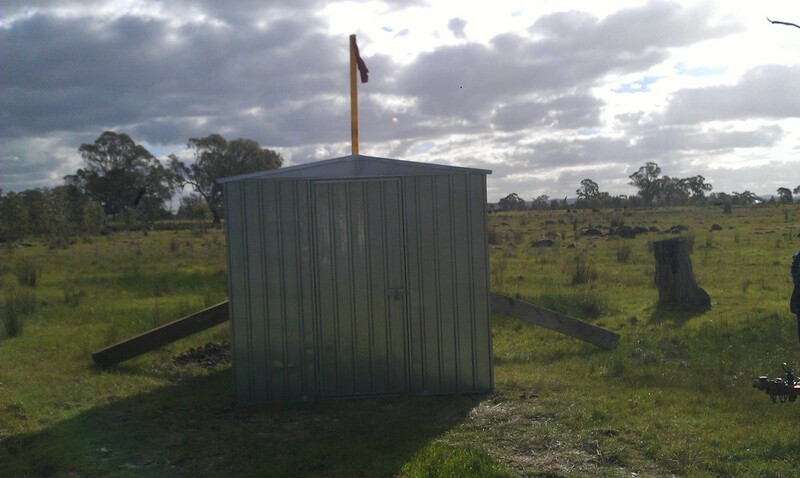 So, over the weekend, we took the first step towards this off-grid path and implemented a two by two metre shed, along with a 3m pole, near the central dam. An 80w Solar panel will be mounte onto the top of the pole to collect those wonderful rays and convert them into 12v electricity that will fill up two 100Ah Marine batteries. They in turn, will be parrallelled to provide a 24v connection to a 1200w inverter which will produce 240v required to power a new submersible pump and an electric fence energiser. The pump will initially be used to help water the seedlings but will take up permanent residence as the provider of water to a supertrough for cattle so as to offer them clean water and keep them out of the dam. The energiser will allow us to reinstate the electric fencing system. The fences need a good deal of repair work and as part of the process, we will slowly remove barbed wire, and replace it with an offset based hotwire that will deter cattle from using the current fencing as a mere inconvenience and will also give the wallabies a new reason to re-consider their passageway through our regen zones. Solar panel, inverter, energiser, pump and batteries should all arrive this week, so we may have it all up an running by next weekend. I wonder if there is a German word for this feeling? I know there’s a colloquial word but I doubt it’s meant to be repeated in polite company. So it turns out that wallabies quite like the taste of river red gum saplings. So much so that they will leap up over the rocky terrain, rip off the tree guards and devour all but two of the fifty we had planted out last weekend. As I do not have the budget to even consider a kangaroo proof fence for that stretch of planting, the trees will instead be planted around the central dam. This has meant we have expanded the central corridor by an additional 2 hectares and it now includes the central dam as part of it. As part of this design change, we are implementing a net based fence with offset electric wiring to dissuade cattle, and wallabies. we are also now looking at placing a pump and 3m trough for the cattle so they no longer access the dam directly. Perhaps this will include future plans for the dam as well, but, one stage at a time. I knew I had bitten off more than I could chew with this project, but I never thought I’d have to kill off parts of it. This weekend, we headed up to the lot to test out our process for planting. 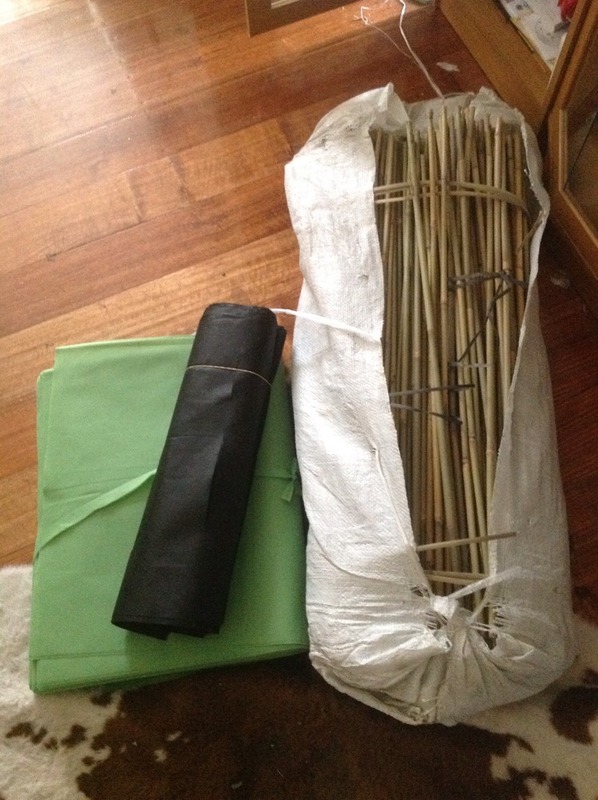 We had rolled up “kits” the night before by grabbing three bamboo stakes and rolling them with a weed mat and tree guard. The thinking was that one could grab a plant and a kit ready to go. Walking the lot and planting the trees taught us a few things. The hard clay soil and rocks were known factors, but the difference weight and strength make on the process and speed of producing holes was quite remarkable. Further, the surprising aspect was not in producing plantable holes for the saplings but in the completely unexpected difficulty of inserting the bamboo stakes in certain sections. In fact, we broke quite a few trying to get enough stake into ground to hold the guards open. All in all, though, we still managed to get a plant in the ground at a rate of 3 to 7 minutes s piece. Not bad if we say so ourselves. Thinking it over, I have a new hypothesis on improving the efficiency of the continued planting process. 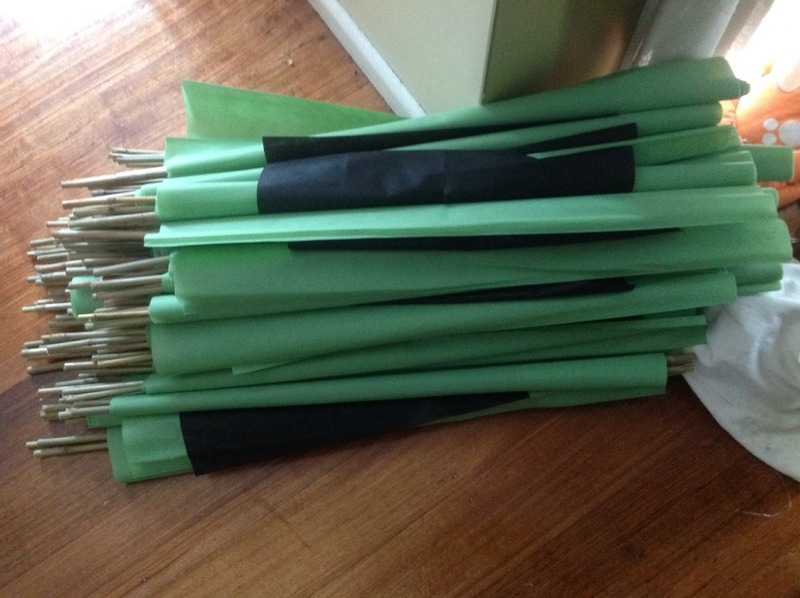 the idea is to split it out into three primary tasks. The first team can race forward, predefining planting locations and creating the holes required. The second team can then follow up with weed mats and plants while the last team can follow up behind with wire prongs to “pre-drill” the soil for the insertion of the stakes and the tree guards. We’ll try that process out this weekend and report back. Call for Volunteers! Saturday 06 October, 2012! 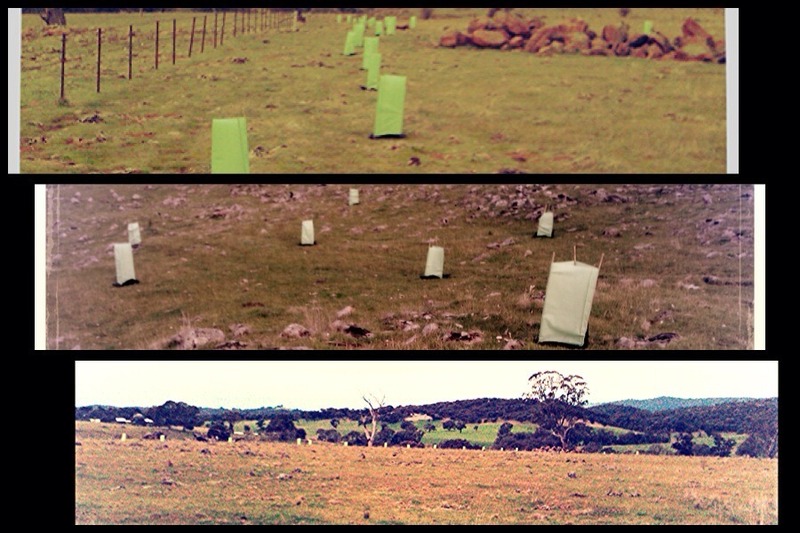 3 planting projects, 4,000 saplings over a combined 15 Hectares. That is the challenge we invite you to share with us. Over the next few weekends, we are commencing works to begin preparing the plants for planting. * provides people with somewhere nice to go for a walk! However, it’s too big of a job to do all on our own before the harsh summer sun starts beating down again, so we are putting out a call for volunteers to assist with our wildlife corridor planting project. If you can plant a seedling, carry a box, cart people around in a 4WD or grill a mean snag, then we want you! Please let us know if you are able to assist on 6th October, (Saturday) and specify if you can assist in the morning [9.30am to 12.30pm], afternoon [1:30pm to 4.30pm] or indeed the entire day. Please forward this onto anyone whom you may think will be interested. We can also be contacted on 0403 397 977.